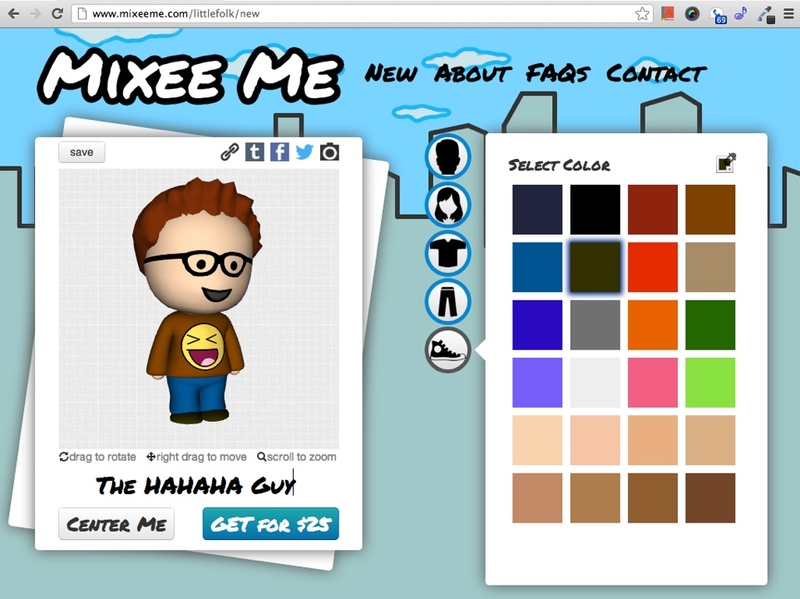 Mixee Me makes it easy to make 3d printed cartoon versions of yourself and friends with their free online figurine designer. Mixee Me Co-Founder Aaron Barnet took some time to answer our questions about Mixee Me’s growth, its technology, and what he sees as the future of 3d printing. What’s your favorite Mixee so far? My favorite Mixees are the ones that play a role in people’s lives. For example, one couple bought Mixees of themselves to take on their honeymoon, and they want to take pictures of their Mixees in their honeymoon locations as a memento. Another pair of Mixees was recently involved in a marriage proposal. How has the reception been of Mixee Me? The reception has been really exciting. We don’t have a budget for traditional marketing, so we’ve been relying on blog coverage and word of mouth which has led to some great coverage. Everybody from artists to soccer moms have been using Mixee. 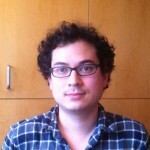 integration with the Shapeways API? 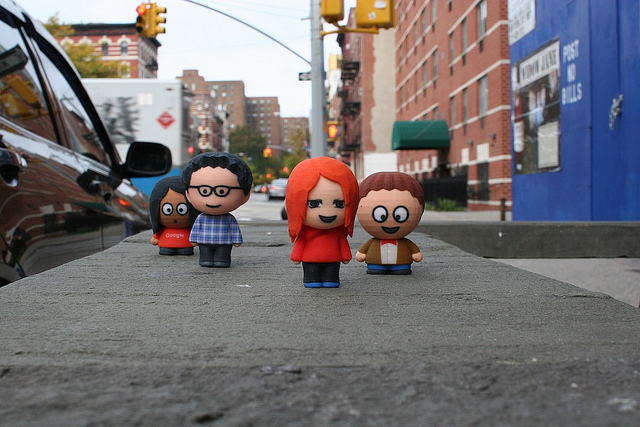 Shapeways made launching MixeeMe really easy because they take care of payment, manufacturing and shipping. Our current site only has a couple hundred lines of ruby code to deal with the Shapeways API, so it wasn’t that hard to integrate. They’re also working on a newer restful API that uses JSON that should make integration even easier (the current one is SOAP based). What design tools do you and Nancy use for 3d models? We’re fans of open source software and use Blender for modeling. What’s the workflow like to bring a new hairstyle or addon to Mixee Me? Right now the process is manual. In the future we want to make the process much better, so we can support a much larger and more dynamic library of parts. What’s been the most surprising thing you’ve learned starting MixeeLabs? When we started, we thought people would be creating more imaginary characters. After launching, though we realized that our users were more interested making Mixees of people they knew. products do you think people want to see more of? Making modeling software for normal people who don’t consider themselves designers is the future. However, non-designers don’t necessarily think of themselves that way. The trick is to create something that enables people to design stuff without the effort and training that traditional modeling software requires. Mixee Me does this but but is more narrowly focused on one product category (cartoon people). For example, rather than asking people to draw or model eyes, we try to group eyes in terms of emotions (happy, snarky, angry). This way, people who can’t model or draw can still express the emotions and concepts they want to express. What do you think about Sculpteo’s new white label printing? What would influence your decision between it and Shapeways if you were building Mixee Me from scratch now? 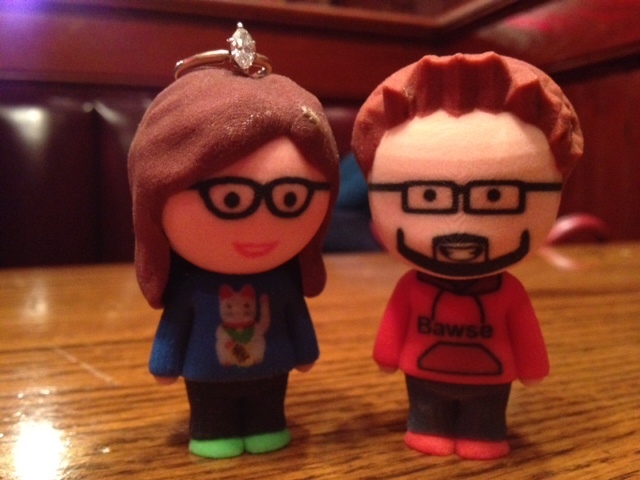 We’re more familiar with Shapeways and have built up a good relations with their team. something similar behind the scenes? We do use netfabb to check models, but we also design the parts to fit with each other in such a way we don’t need to worry about creating non-printable designs. Shapeways has great checks and automatic fixes during their upload process also, which helps fix some basic issues (inverted normals, small holes). Nancy was the Materials Lead at Shapeways and authored their design guidelines, so that helps us to design optimally for 3d printing. Can you give us a few details about your Server Stack? The backend is a pretty vanilla Ruby on Rails setup on AWS EC2 with PostgreSQL. The front end is written in Coffeescript with jQuery, and we use X3DOM for all the webGL 3d graphics. X3DOM is useful because it provides a flash fallback that allows us to support older browsers and IE (although the flash version is much slower). If you were running 3d Systems, which company would you buy next? I definitely don’t know the first thing about acquiring other companies. Right now, we’re focused on just building our own. What do you think the 3d printing landscape will look like in three years? Right now the consumer 3d printing market is focused on hobbyists excited to try out a new technology. As the technology expands, I think there will be less focus specifically on 3d printing and more focus on custom manufacturing. 3d printing will eventually just be one means to an end. Where do you see MixeeLabs going next? Right now we’re still focused on improving Mixee Me. We continue to add features and new models. Longer term, we want to open it up so that others can contribute body parts and designs to use in Mixees.